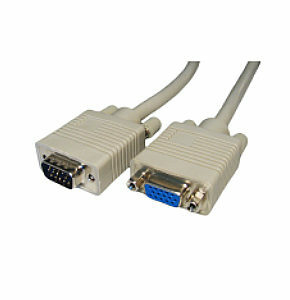 2m VGA Extension Cable / SVGA Extension Cable. 2m VGA extension cable / SVGA extension cable, ideal for extending a PC or laptop to monitor cable. Male to female monitor extension cable. HD15 Male D connector to HD15 Female D connector. 2m Displayport Cable - Monitor Cable - Displayport Male to Male Connects a displayport equipped PC to a monitor. Cable length 2 metres (2m) Supports resolutions 4k 60Hz, 2560 x 1600 and 1080p. 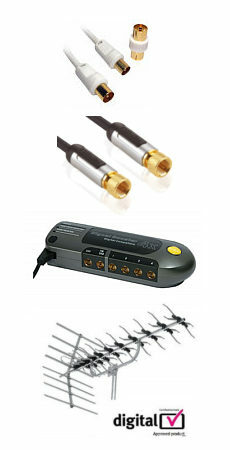 Premium cable for transferring high-bandwidth, uncompressed digital video, multi-channel digital audio and control functions. 28AWG 5 Pair Cable. Supports 8 channel, uncompressed 24bit audio. Bandwidth: 21.6 Gbps 2 year warranty against manufacturing defects. Profigold PROM291 High Performance Mini DisplayPort to DisplayPort Adapter 0.2 m. Connect your Mac with Mini DisplayPort to a screen with DisplayPort input. Transforms a Mini DisplayPort connection into the more commonly used DisplayPort connection Complies with DisplayPort 1.1 standard for unmatched sound* and picture quality Suitable for display resolutions up to 2560 x 1600 pixels White ultra-flexible PVC cable jacket for ease of handling Slim-line plug design for maximum compatibility with portable equipment Superior grade 99.996% oxygen-free copper to guarantee lowest signal loss Double shielded cable construction to ensure highest data transfer without any loss.Note: *Audio support is only available for Mac Book Pro 13/15/17 inch mid-2010 release and iMac 21.5/27-in early-2010 release.